As far as music festivals go, Hillside stands in stark contrast to the major corporate ones of today. 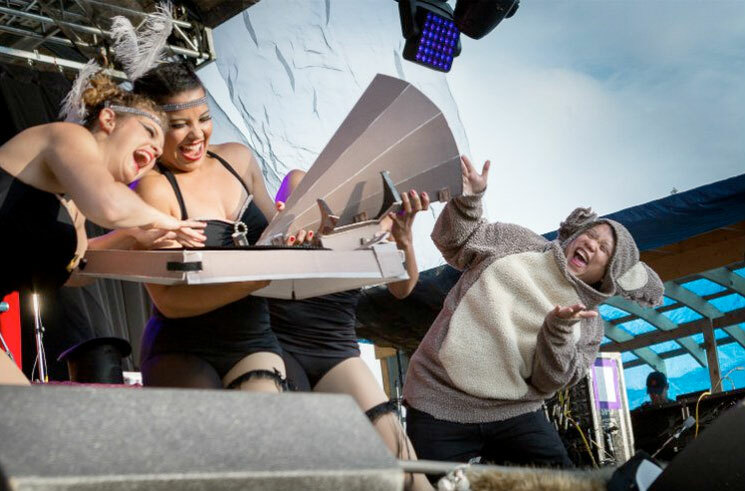 It has a distinctly independent and handmade feel, making Canadian turntablist extraordinaire Kid Koala and his Vinyl Vaudeville Show the perfect match for the festival. In 2014, Kid Koala was recruited by the festival to play a last-minute Sunday set after British producer/DJ Four Tet was forced to cancel due to a family emergency. Unfortunately (as is strangely common with the final day of Hillside), it was rained out. His return two years later — with a red curtain as a backdrop, sparkly gold letters spelling out the name of the show, a crew of dancers, puppets and set pieces galore — felt like he was making up for lost time, and then some. "How it works is it's gonna start weird and get progressively weirder throughout the hour," Kid Koala said to the audience moments after stepping on stage. He wasn't lying. Not only was he performing without the common DJ gear of the day (i.e. a laptop and a pair of headphones), but there was a piece of performance art to back up nearly every track. Following a short intro that included The Slew standout "Robbing Banks (Doin' Time)" and choice cuts from Jay Z's Black Album, the White Stripes and OutKast, things got strange when he began to play from his not-so recent album 12 Bit Blues, with a trio of dancers flapping feathers on stage and performing in tune with his reconstructed bluesy beats. After jumping into the crowd and getting everyone to channel their inner five-year-old while dancing along to his Yo Gabba Gabba song, a group of metalhead puppets demonstrated how to mosh, a nine-foot ogre terrorized the crowd and some dancing stereos slunk about the stage. If there was a separation between audience and performer before, the lines became increasingly blurry once Kid Koala set up a remote sampler and dove with his dancers into the crowd to create the world's biggest conga snail (his soon-to-be-trademarked spiralling concert creation) as he performed "7 Bit Blues" while helping lead the line. After a heartfelt rendition of "Moon River" dedicated to his mother, Kid Koala and his crew pulled all the last tricks out of their tickle trunk for his final number, "8 Bit Blues," throwing lollipops at the crowd, using a slingshot to shoot tote bags into the audience and launching hundreds of paper airplanes. It was the perfect end to a small-scale spectacle that felt larger than life.